This book examines the practices in Western and local spheres of humanitarian intervention, and shows how the divide between these spheres helps to perpetuate Western involvement. Using the Democratic Republic of the Congo as a case study – an object of Western intervention since colonial times – this book scrutinizes the contemporary practice of humanitarian intervention from the inside. It seeks to expose how humanitarian aid and peacekeeping works, what obstacles they encounter and how they manage to retain their legitimacy. By examining the relationship between the West and the DR Congo, this volume asks why intervention continues to be so central for the relationship between Western and local spheres. Why is it normal and self-evident? The main answer developed here is that the separation of these two spheres allows intervention to enjoy sufficient degrees of legitimacy to be sustained. Owing to the contradictions that surface when juxtaposing the Western and Congolese spheres, this book highlights how keeping them separate is key to sustaining intervention. Bridging the divide between the liberal peace debate in International Relations and anthropologies of humanitarianism, this volume thus presents an important contribution to taking both the legitimizing proclamations and ‘local’ realities of intervention seriously. The book will be of much interest to students of statebuilding, peacebuilding, peacekeeping, anthropology, research methods and IR in general. 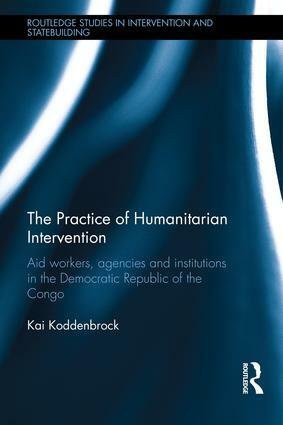 ‘The Practice of Humanitarian Intervention is an original analysis full of fascinating insights and grappling stories about international aid in Congo. It is an excellent resource for all those interested in better understanding the peculiar world that interventional interveners inhabit.’ -- Séverine Autesserre, Columbia University, USA. ‘Social transformation takes deep social penetration. As Koddenbrock demonstrates in minute detail, half a century of Western intervention amounts to little more than a road trip. Predictably, superficial engagement spells superficial transformation.’ -- Iver Neumann, LSE, UK. Kai Koddenbrock is lecturer at the Institute of Political Science at the RWTH Aachen University, Germany, and a fellow of the Global Public Policy Institute, Berlin. He holds a PhD in International Relations from the University of Bremen.